Children of the Street "Drilling the Gang" on Mulberry Street. 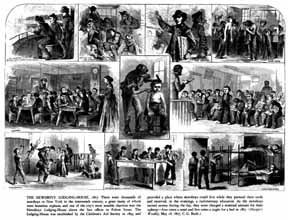 During the period after the Civil War the population grew and the problems of juvenile reform became larger and more dynamic. Immigrants from Italy and Eastern Europe, who followed their Irish and German predecessors, increasingly dominated New York's cultural landscape. These immigrants worked longer hours and lived in increasingly improverished conditions as the century progressed. In an effort to escape their cramped quarters, tenement dwellers socialized on the streets, a practice that exposed children to the dangers of criminal activity in the community. Whether or not children encountered trouble, they were more visible on New York City's landscape then ever before. SCHOOL OR JAIL? reflects the reformist approach to the problems of juveniles, lack of adequate schooling would lead to a life of crime. In 1865 the New York State Legislature enacted a bill to control the "disorderly child," (a term roughly synonymous with today's label, "person in need of supervision"). The Act provided that, following the complaint of a parent or guardian, a magistrate or justice of the peace could "issue a warrant for the apprehension of the youthful offender." If a child was found to be disorderly, the court was required to commit the child to the House of Refuge. 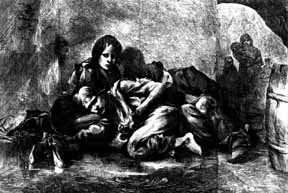 The NEWSBOYS' LODGING HOUSE, 1867. There were thousands of newsboys in New York in the 19th century, a great many of whom were homeless orphans. The Lodging House was located above the Sun offices on Fulton Street, established by the Children's Aid Society in 1854. (Harper's Weekly; May 18,1867;C.G. Bush). Though the Disorderly Child Act hinged on parental complaint, it represented a move away from parental authority. Under the Act, a child did not need to have committed a crime - "disorderly" conduct was sufficient justification for placement. Additional measures designed to reform child behavior soon followed. In 1875 the Society for the Prevention of Cruelty to Children was formed to protect the rights of children. 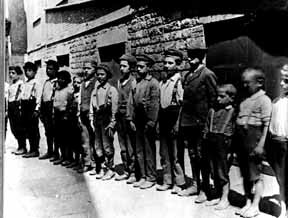 Along with similar groups, the Society campaigned for a series of legal reforms in the 1870's and 80's that resulted in a child neglect statute, the Parens Patriae Doctrine (which granted the state the state the inherent right to assume custody of children), and a codified assemblage of children's laws. These efforts culminated in the creation of a separate children's court system in 1892, which allowed for all cases involving the commitment or trial of children, to be heard and determined by a court devoted to juvenile cases.